Of the 1,585 UN Volunteers deployed in different peacekeeping missions around the world, 1,200 serve in Africa. Over 400 serve with the UN Mission in South Sudan (UNMISS) alone, and close to 800 serve with the UN Multidimensional Integrated Stabilization Missions in Mali (MINUSMA) and in the Central African Republic (MINUSCA), and with the UN Organization Stabilization Mission in the Democratic Republic of the Congo (MONUSCO). Until March this year, UN Volunteers also served with the United Nations Mission in Liberia (UNMIL). 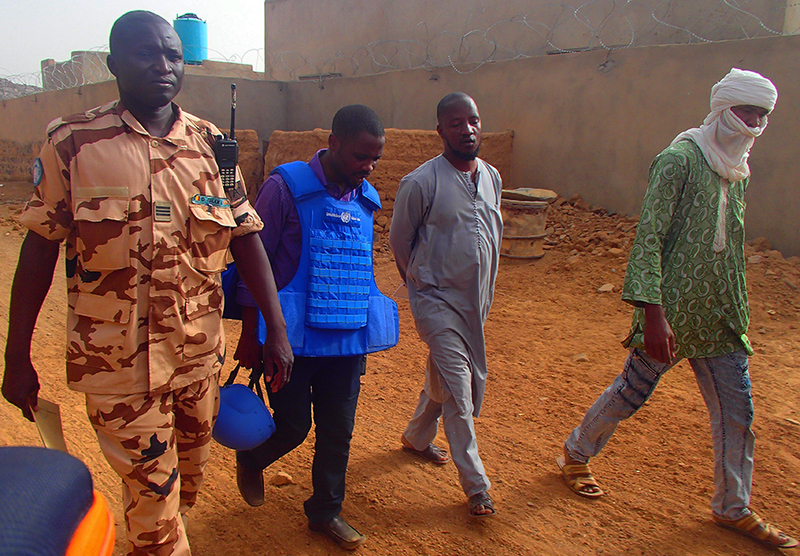 Gideon Wanada, UN Volunteer Civil Affairs Officer (centre, with blue vest) in Kidal, Mali, at work with his colleagues from MINUSMA. More than 400 UN Volunteers advance peace and development through the United Nations Mission in South Sudan. They are crucial to the success of the mission, volunteering with dedication and performing a range of positions from Communication Officers to Vehicle Technicians. Every day, they go above and beyond in their assignments while enduring hardship conditions. In West and Central Africa, MONUSCO and MINUSMA rely heavily on the contribution of UN Volunteers who provide security and maintain peace in northern Mali, for example. They also go the extra mile to assist victims of violence, like UN Volunteer Information Analyst Ouedraogo Mohamadi. In January 2017, Ouedraogo Mohamadi mobilized his volunteer colleagues in Gao to donate blood in solidarity to the victims of a deadly attack perpetrated against the Operational Coordination Mechanism. "The work we do is often risky and at times very dangerous, but it is necessary," he says. In central Africa, peace and social cohesion are at the core of the efforts of UNV and UN Volunteers. Catherine Moore UN Volunteer Planning & Coordination Officer with MONUSCO, is one of those volunteering in the DRC. Since 2017, she has been in charge of planning and coordination in Dungu (Eastern Congo DRC), a region affected by an armed conflict. In her view, establishing dialogue between civilians, the military and the UN police force is a necessity to stabilize the region. In Liberia, UN Volunteers played a key role in the success of UNMIL, which completed its mandate on March 30 of this year. UNV and its partners appreciate the legacy of UN Volunteers who served the people and UN Mission of Liberia from 2003-2018.